On July 28th, 2015, Congresswoman Debbie Dingell (MI-12) announced the formation of the bipartisan Congressional Cancer Prevention Caucus. The caucus, which is the first of its kind, was formed in collaboration with Bill Couzens, Founder of National Cancer Prevention Day and the non-profit organization Next Generation Choices Foundation, widely known as Less Cancer, to expand education and awareness about cancer prevention. The American Cancer Society estimates that more than 1.6 million Americans will receive a cancer diagnosis this year and approximately 589,430 people will die from this devastating disease. The Congressional Cancer Prevention Caucus is designed to help stop this staggering trend by providing a bipartisan forum to engage Members of Congress, their staff, the medical community, advocacy groups, academia and the public on lifestyle and environmental factors that can reduce cancer risk. The caucus will seek to increase education and awareness and advance policy solutions that improve public health and help prevent cancer before it starts. 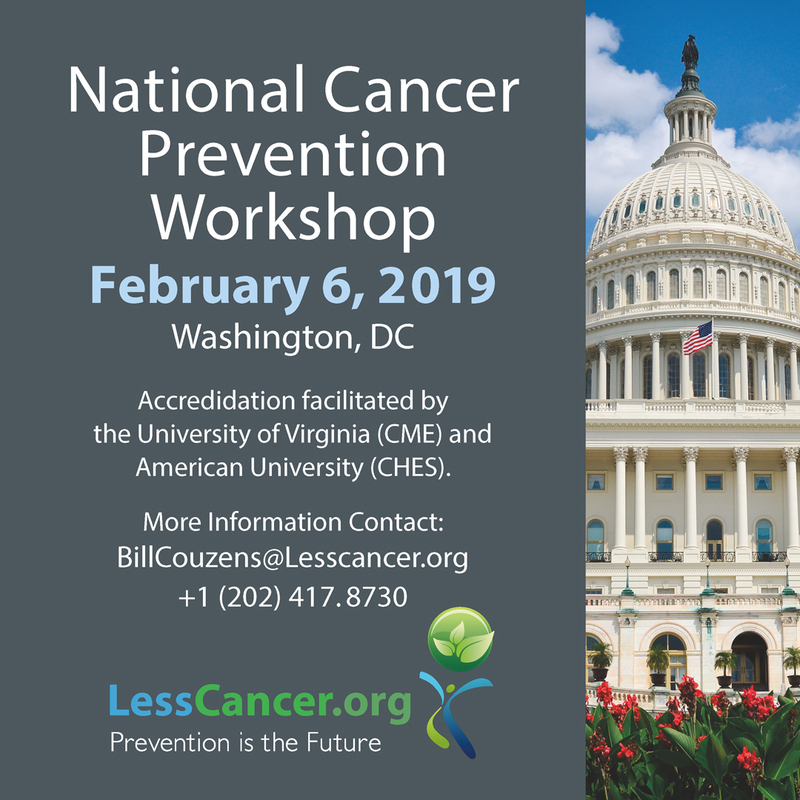 The 2019 Cancer Prevention Caucus will be held on February 5, 2019. Less Cancer’s work to inform the public about health and environment spans a wide range of issues, including specific contaminants, pollution sources, and healthy lifestyle choices, such as diet, exercise, and nutrition. While we work to protect all communities, our approach is particularly relevant to at-risk populations, such as families and children in low-income communities.